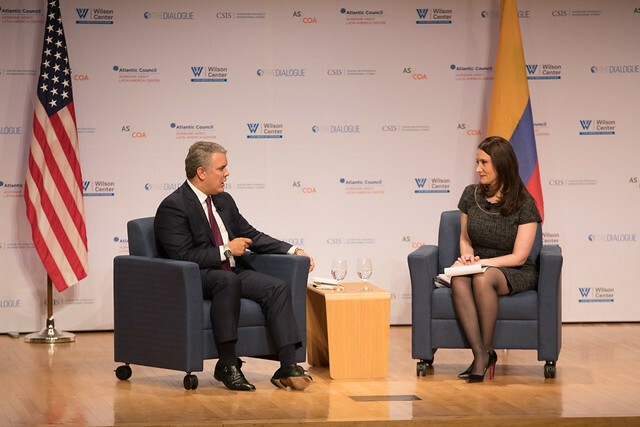 In this conversation moderated by Michelle Caruso-Cabrera, President of Colombia Iván Duque discussed Colombia’s agenda and the main goals of his administration. He reviewed the state of the implementation of the peace agreement with the former guerrilla movement, the FARC; the threats from other armed groups and drug traffickers; and the regional response to the humanitarian and political crisis in Venezuela, among other topics. Duque was sworn in as president of Colombia on August 7, 2018. From 2014-18, he served as a senator in the Colombian Congress, representing the Democratic Center Party. He worked at the Inter-American Development Bank in Washington for over a decade. To join the conversation via Twitter, use the hashtag #DuqueDC. How do you get to lasting peace with FARC?